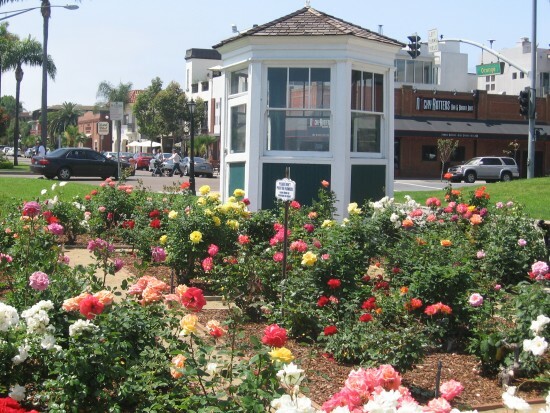 flowers – Page 13 – Cool San Diego Sights! Flowers remember somebody’s best buddy. I snapped this pic today after work, while walking to a trolley station in Mission Valley. The simple memorial was by a busy sidewalk. It’s a sidewalk traveled by many homeless people. 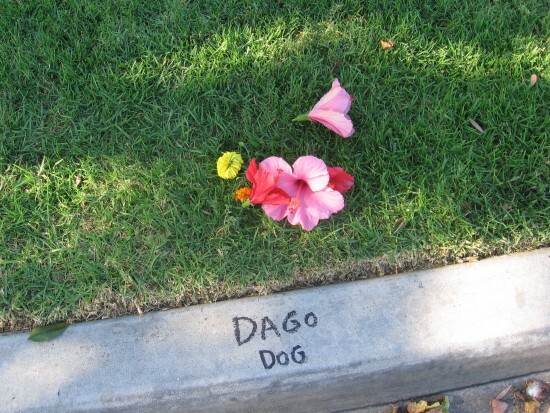 I’m almost certain Dago Dog was the best buddy of a homeless person. No more words are necessary. Posted on May 29, 2014 June 6, 2015 Tags beauty, dogs, flowers, homeless, life, memorials, mission valley, people, pets, writingLeave a comment on Flowers remember somebody’s best buddy. 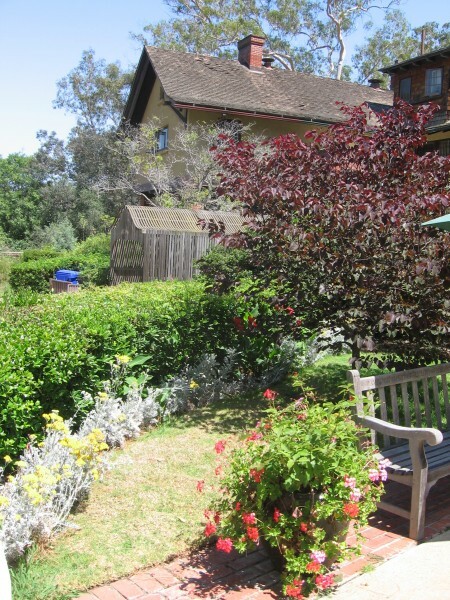 Beautiful garden of Balboa Park’s Marston House. 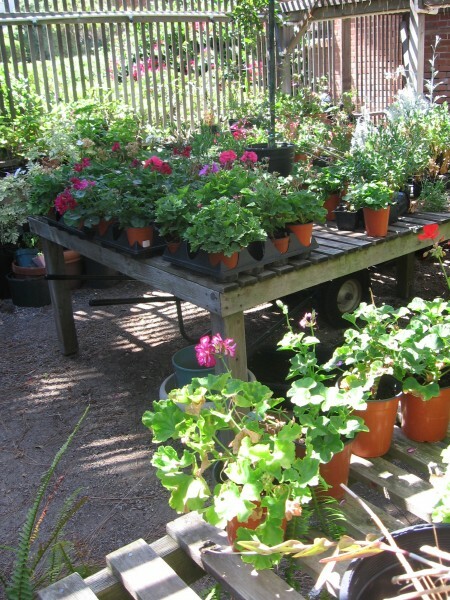 Flowers and bench by historic Marston House. 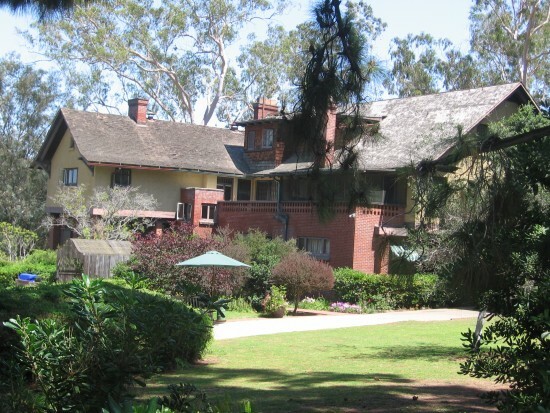 The historic Marston House is nestled among some trees in the seldom-visited northwest corner of Balboa Park. 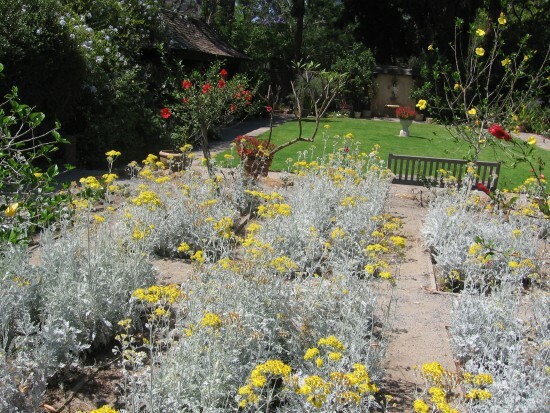 The house museum and its beautiful gardens are truly one of San Diego’s hidden gems. I strolled about the grounds recently and took a few photos. Roaming about the gardens is free; to take a guided tour of the house’s interior one must pay a small entrance fee. 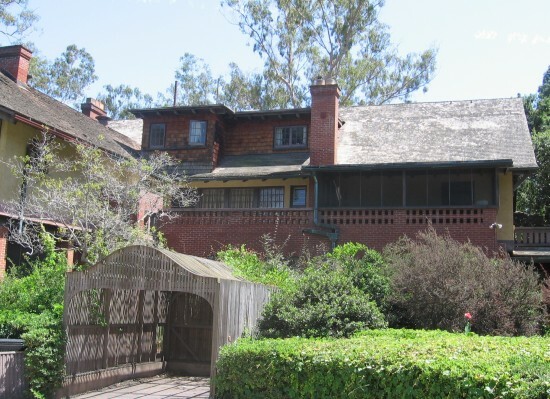 The house, in the Arts and Crafts architectural style, was built in 1905 by George W. Marston, a wealthy philanthropist who owned a prominent department store. 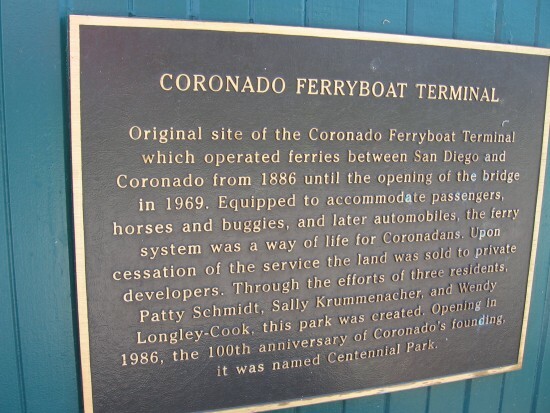 He was also founder of the San Diego Historical Society, and was instrumental in preserving the site of the original San Diego Presidio. 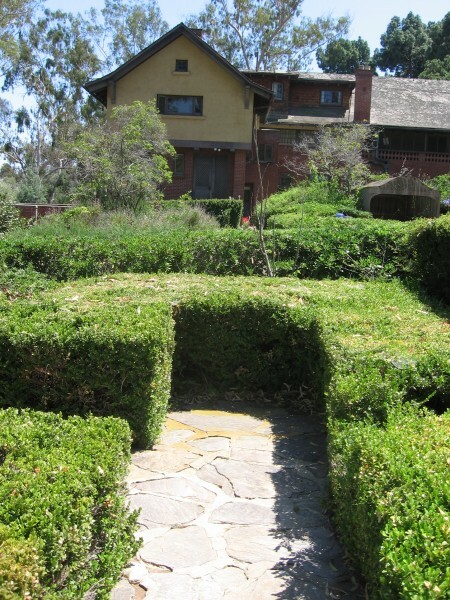 The Marston House was designed by the internationally famous architects William Sterling Hebbard and Irving Gill. Its five acres of lawns and formal gardens have become a very popular wedding location. 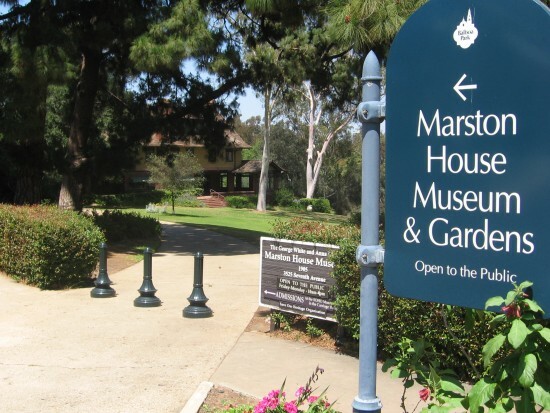 Marston House Museum and Gardens in a corner of Balboa Park. Arts and Crafts style house was built in 1905. This beautiful garden is a popular wedding location. Looking from hedge pathway toward Marston House. 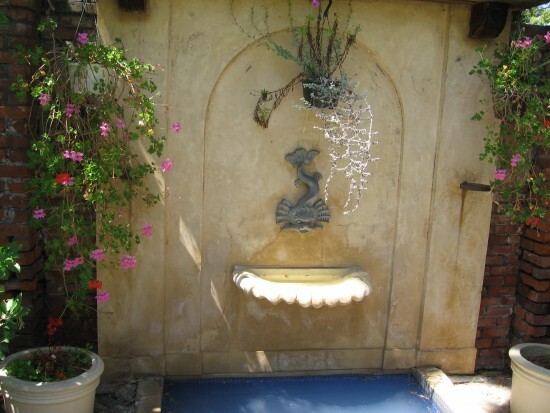 Small fountain at end of garden. 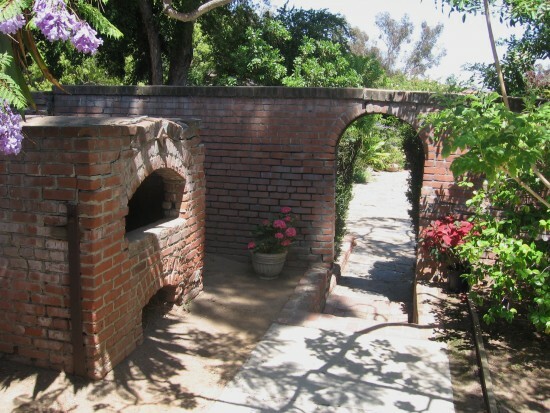 Outdoor archway and oven are part of the delightful scenery. A pic of the lath greenhouse interior. The Marston House is a San Diego hidden gem. 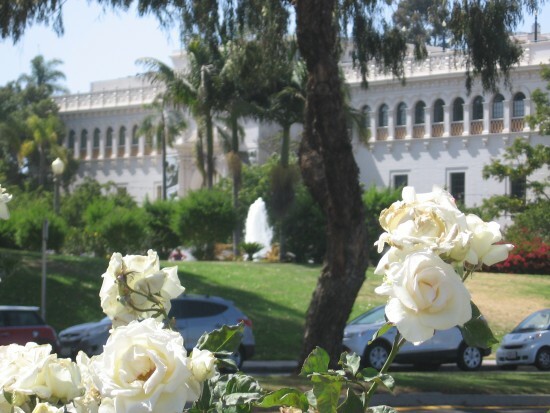 Posted on May 29, 2014 June 6, 2015 Tags architecture, balboa park, beautiful, flowers, gardening, historic homes, history, houses, museums, san diego5 Comments on Beautiful garden of Balboa Park’s Marston House. 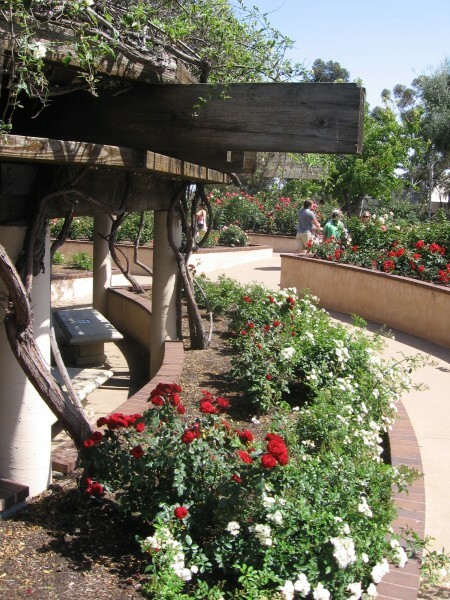 Mother’s Day at Balboa Park’s rose garden. 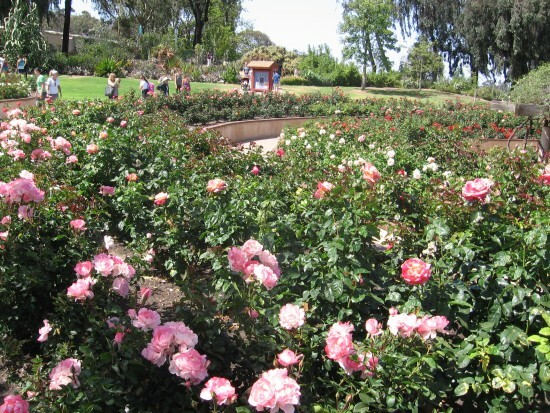 View of Balboa Park rose garden from nearby bridge. Mom passed away some years ago. She loved roses. This blog post is dedicated to every precious mom on Mother’s Day. 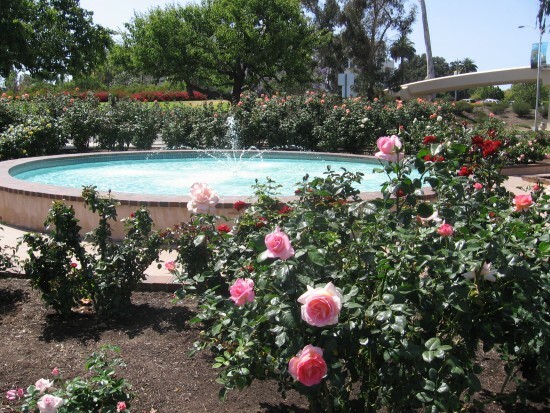 I took these photos today at Balboa Park’s three-acre Inez Grant Parker Memorial Rose Garden. 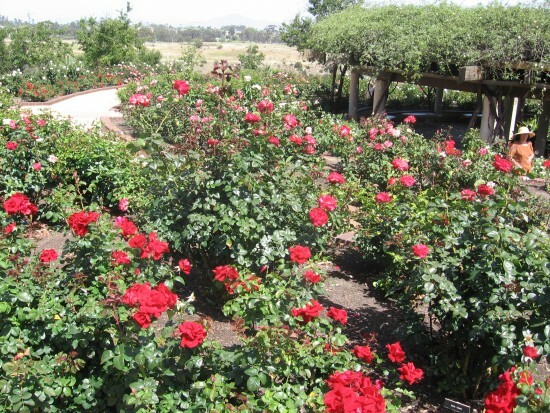 It’s located across Park Boulevard from the Reuben H. Fleet Science Center, and features about 1,600 roses of more than 130 varieties. 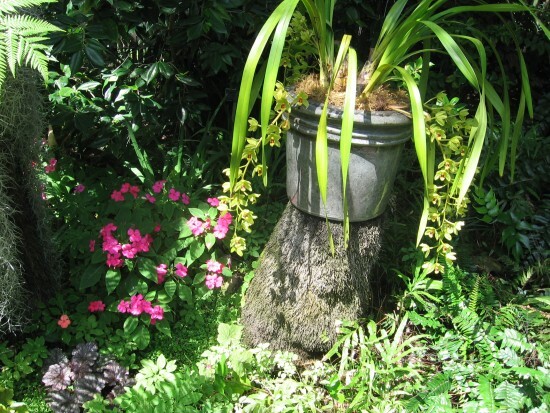 People love to stroll through the lush award-winning displays. Many mothers and families were present today! 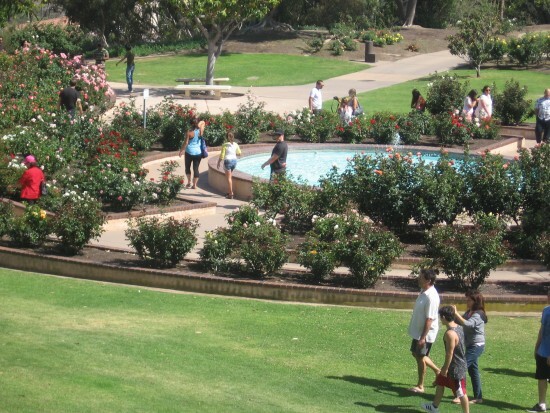 Hundreds of roses surround a large, shady gazebo. Path near the edge of rose garden’s gazebo. 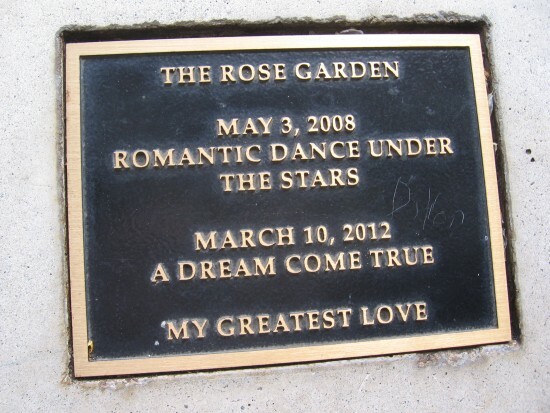 Plaque on one gazebo bench with romantic sentiment. A fountain among the roses. 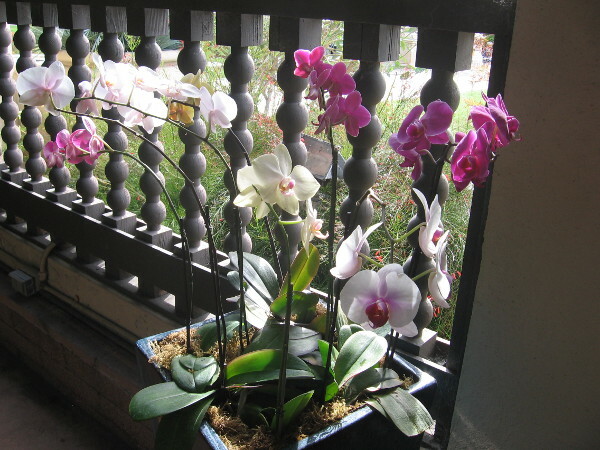 Looking across colorful blooms toward entrance. 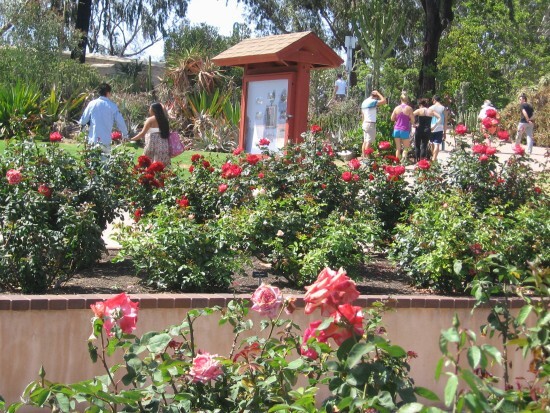 Families enjoy a world-class rose garden on Mother’s Day. Looking over white roses at the Natural History Museum. 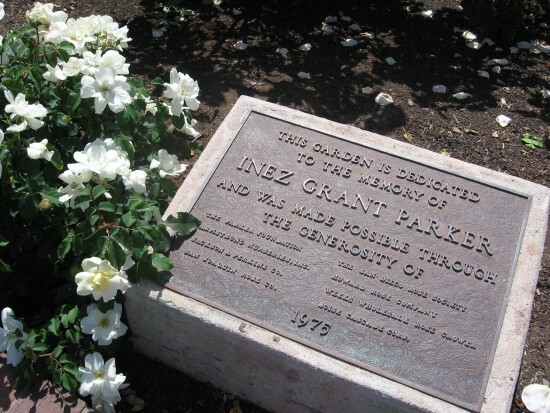 Garden is dedicated to the memory of Inez Grant Parker. 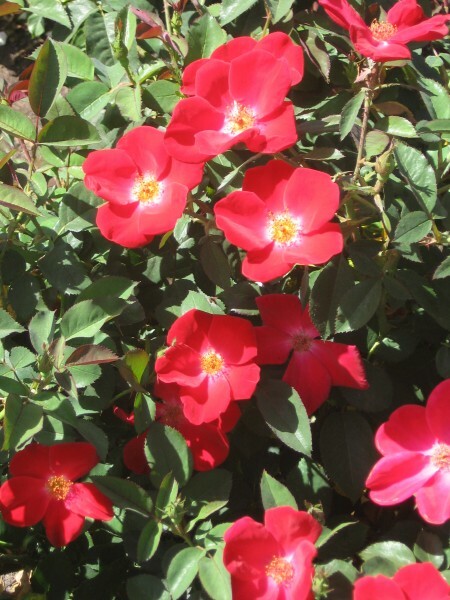 Posted on May 11, 2014 June 6, 2015 Tags balboa park, beautiful, beauty, color, family, flowers, gardening, happy, life, natureLeave a comment on Mother’s Day at Balboa Park’s rose garden. Tranquil beauty near the center of San Diego. Botanical Building by reflecting pool in Balboa Park. In Balboa Park you can retreat from life’s turbulence. Simply walk, read a book, or sit quietly and reflect. You can delight your senses with splashing fountains, green lawns, music, museums. Pleasing architecture is on every side. And there are many beautiful gardens. My favorite garden of all grows in the Botanical Building. Stroll down El Prado and you’ll see an imposing wood lath building at the opposite end of the reflecting pool. That’s the Botanical Building. 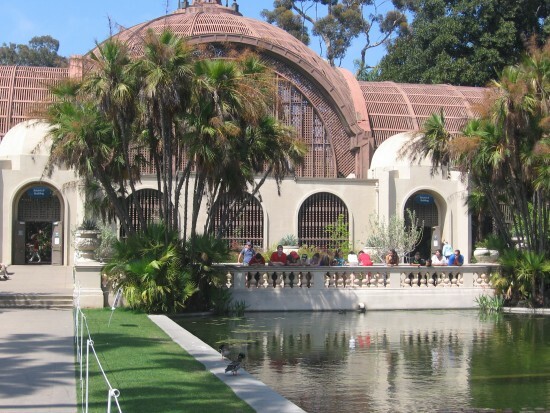 Built for the 1915 to 1916 Panama-California Exposition, the beautiful old structure contains a collection of more than 2000 permanent plants. 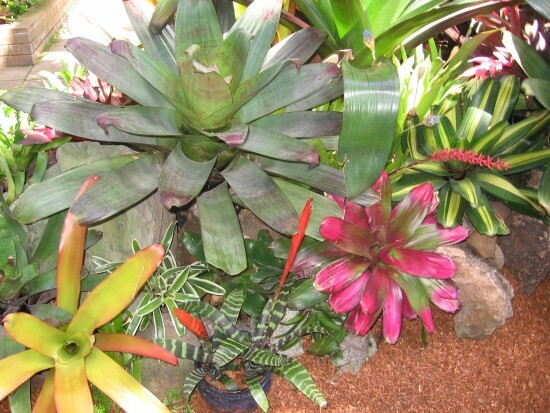 Take a slow walk through it and you’ll discover ferns, palms, orchids and other tropical plants. You’ll hear the soothing bubble of water tumbling into small rocky pools. You’ll smell sweet fragrances and be touched by many colors. You’ll want to linger. 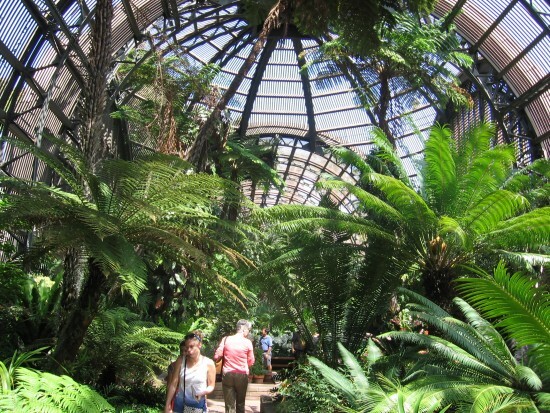 The Botanical Building is open to the public every day except Thursday, from 10:00 AM until 4:00 PM. Admission is free! 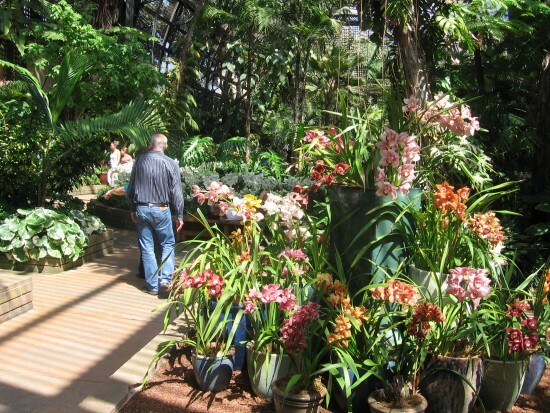 People walk through the huge, lush botanical collection. 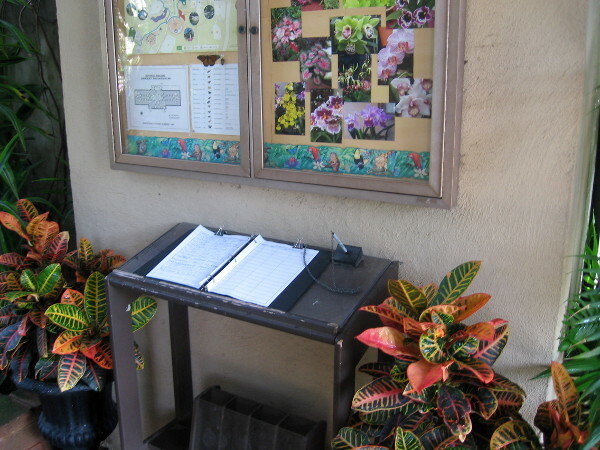 Information and guest book near entrance of historic Botanical Building. 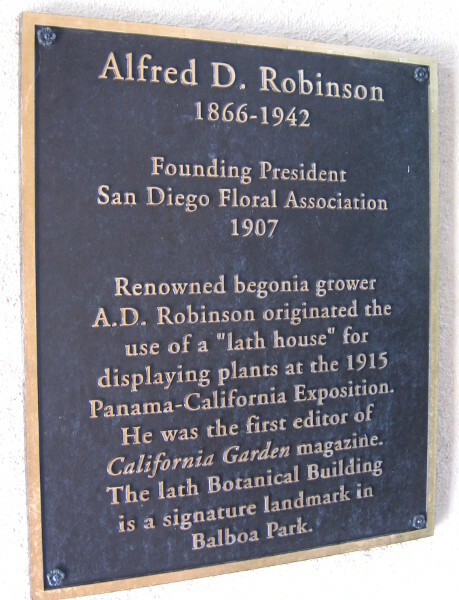 Alfred D. Robinson used building to display plants at 1915 Panama-California Exposition. Hundreds of different plants and endless beauty. Visitors walk quietly through the tranquil, cathedral-like space. Some people just sit on benches and absorb the tranquil atmosphere. 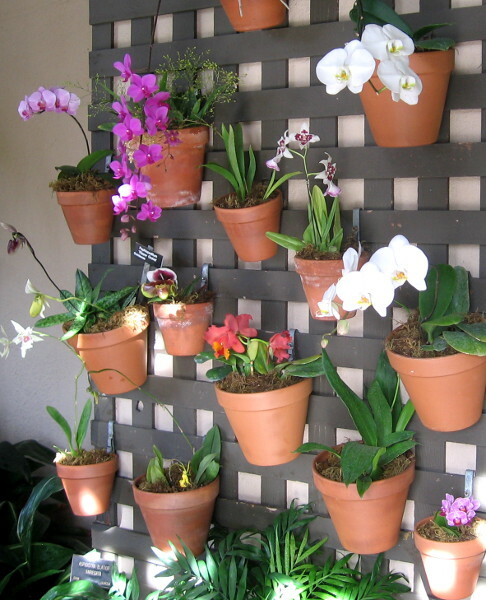 A section of wall bright with colorful blooms. A sample of the natural beauty found in this special place. 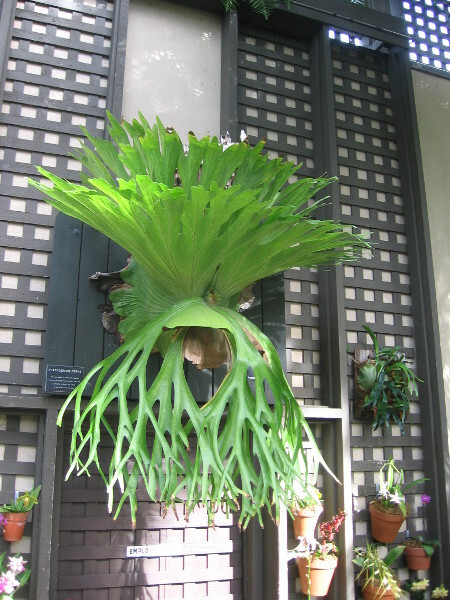 Platycerium, commonly known as the Stag Horn Fern. 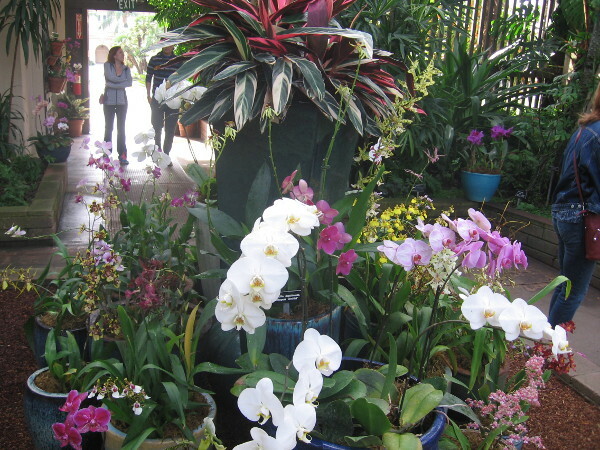 Beautiful orchids and other plants on display in Balboa Park’s Botanical Building. 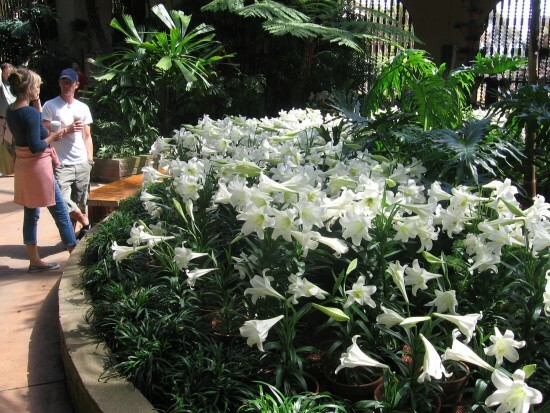 Botanical Building visitors near seasonal display of Easter lilies. 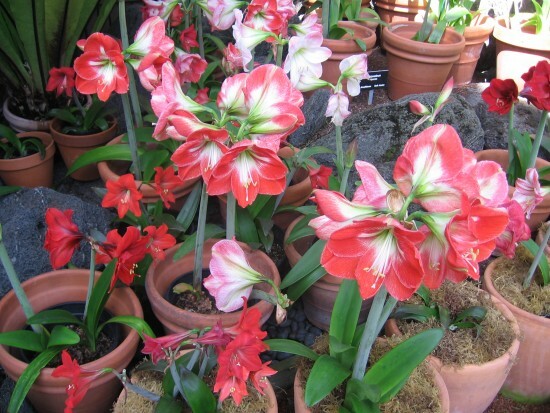 Lots of cheerful, colorful Hippeastrum hybrids. Delicate beauty on display for anyone to see. 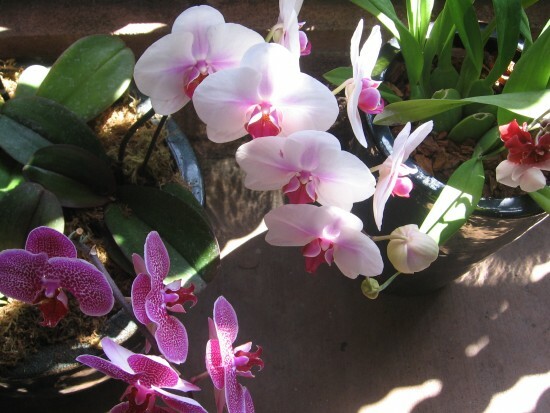 Posted on April 28, 2014 November 7, 2018 Tags balboa park, beautiful, beauty, botanical building, color, flowers, gardening, life, san diego, walkingLeave a comment on Tranquil beauty near the center of San Diego. 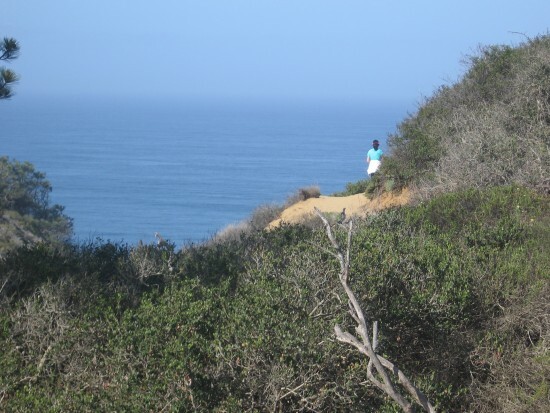 Torrey Pines State Reserve’s Guy Fleming Trail. 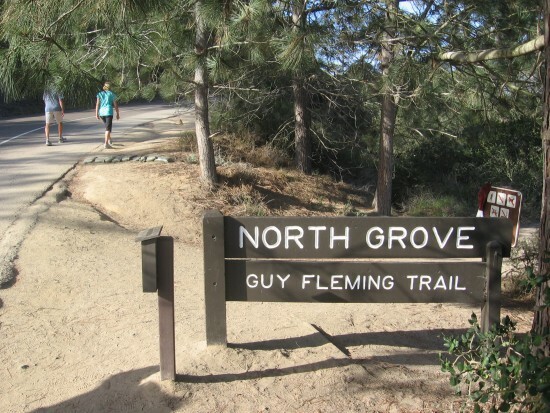 Guy Fleming Trail sign on Torrey Pines Park Road. 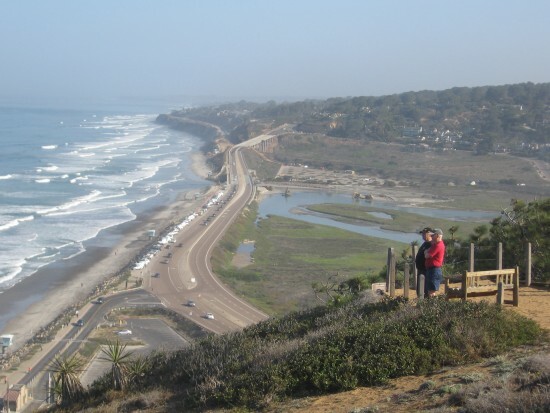 My very, very, very favorite place in all of San Diego County is Torrey Pines State Reserve. 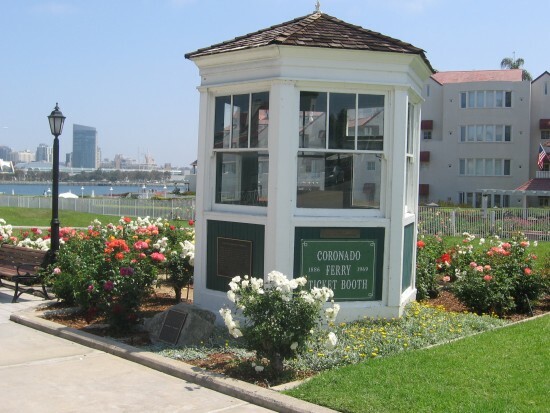 It’s located along the Pacific Ocean in northern La Jolla, between the famous Torrey Pines Golf Course and Del Mar. I took a trip there this morning! I got so many pics, I’ll break my visit up into several blog posts! Let me start by taking you around the Guy Fleming Trail loop. 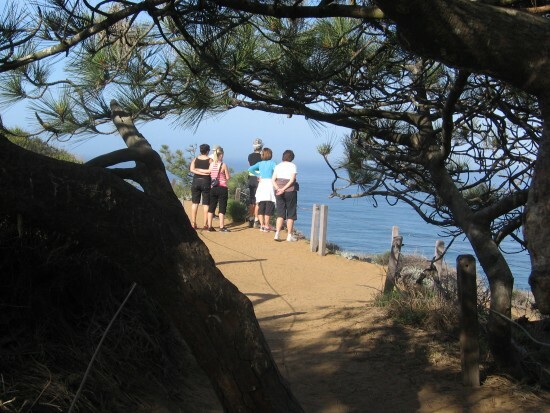 There are many hiking trails to explore in Torrey Pines State Reserve. 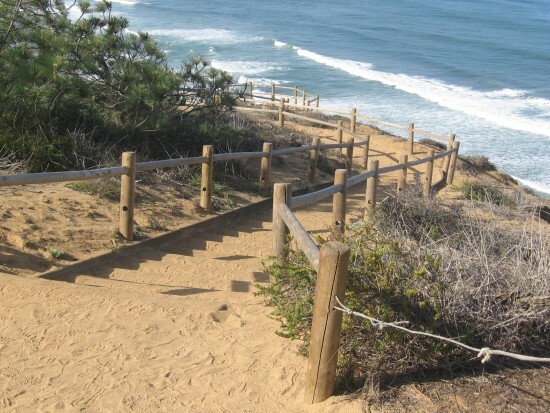 Reaching this particular trailhead requires a short hike or drive from the entrance gate up steep Torrey Pines Park Road. As you head on up, you see numerous pine trees growing atop and clinging to eroded sandstone cliffs. 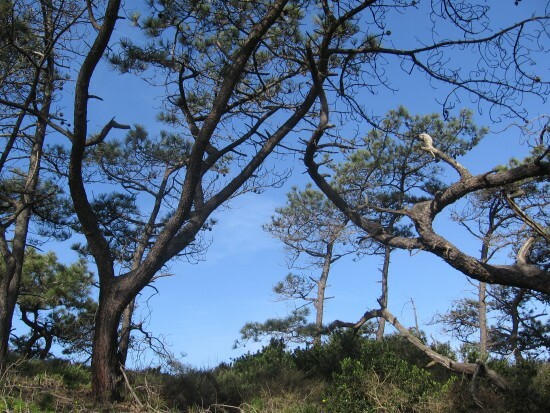 These are the endangered Torrey pines (Pinus torreyana). 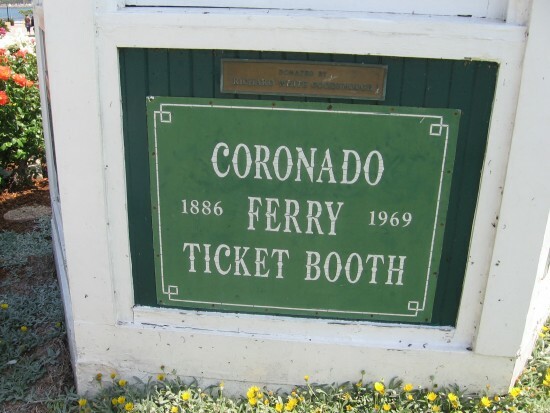 They can only be found here and on the small island of Santa Rosa, off the coast of Santa Barbara. A good concentration of them can be seen on the Guy Fleming Trail. Diversity amid adversity on the Guy Fleming Trail. Here we’ve stepped onto the looping 2/3 mile easy level trail. We’re going to proceed counterclockwise. Look at the sign. 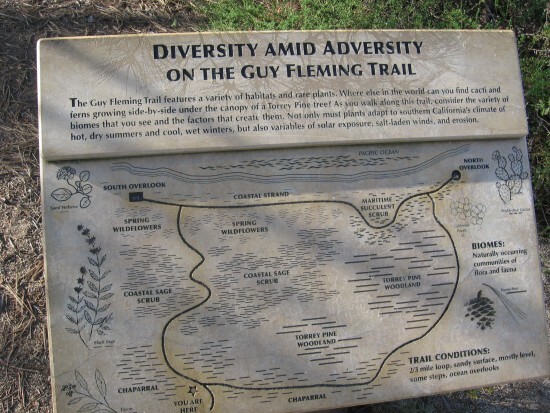 It reads: The Guy Fleming Trail features a variety of habitats and rare plants. Where else in the world can you find cacti and ferns growing side-by-side under the canopy of a Torrey Pine tree? 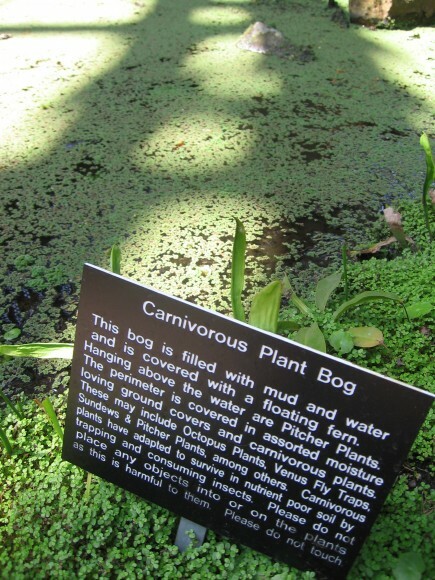 As you walk along this trail, consider the variety of biomes that you see and factors that create them. 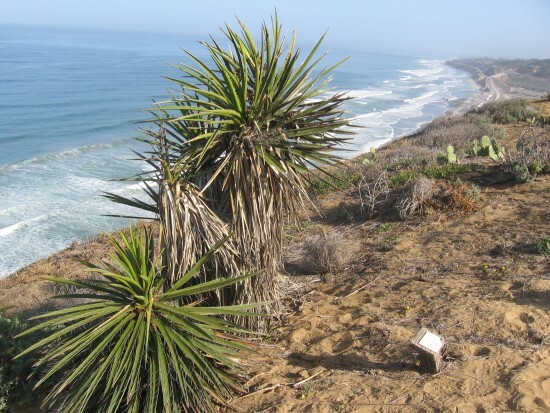 Not only must plants adapt to southern California’s climate of hot, dry summers and cool, wet winters, but also variables of solar exposure, salt-laden winds, and erosion. 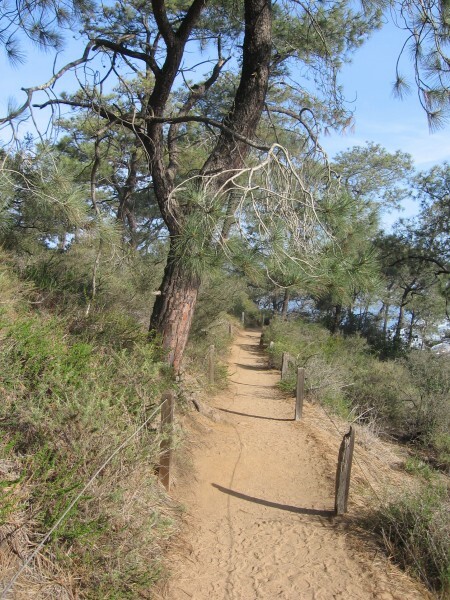 Trail passes under many endangered Torrey pines. Wind-twisted branches of Torrey pines in the State Reserve. Walkers pause to enjoy a breathtaking ocean view. Here we are emerging above the wide Pacific Ocean. These ladies are gazing off into the blue distance. As I came up to them today, they asked excitedly: “Did you see the whale?” A gray whale migrating back northward to the Bering Sea was lingering just beyond the breakers, touching the surface and spouting every few minutes! This whale seemed to be heading north from Mexico a bit late. It’s almost May! Looking north near a scenic overlook on the Guy Fleming Trail. This is one reason why Torrey Pines State Reserve is one of my all-time favorite places. Incredible views! You can see a portion of Los Peñasquitos Marsh Natural Preserve and Lagoon. Torrey Pines State Reserve entrance gate far below. Mojave yucca grow beside amazing trail at edge of steep cliff. Now we’re heading south along the edge of the cliff. 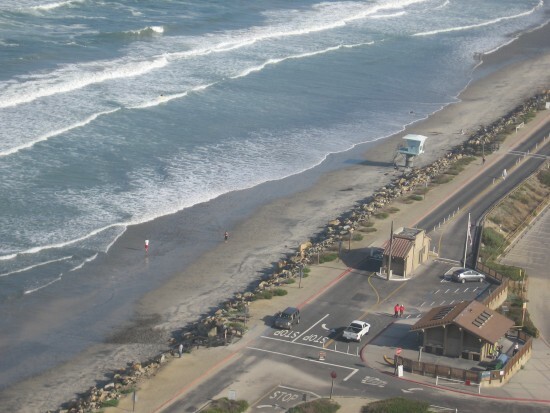 Torrey Pines State Beach is far below. When it’s possible to spy beach-goers, they’re very tiny! Yellow sea dahlias high above foaming breakers. ocean seen from above makes a lasting impression! 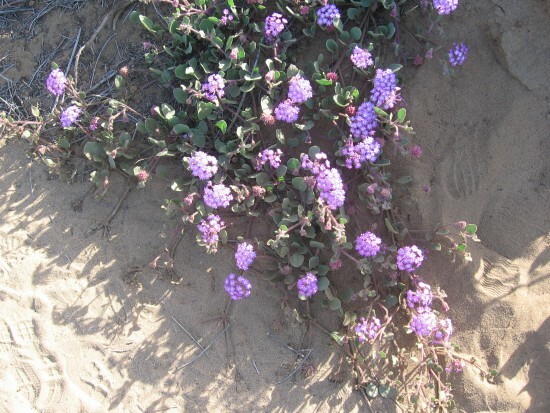 Pink sand verbenas add bright color to a beautiful walk. It’s springtime and many native flowers are in bloom. These dry, brittle hillsides are covered with coastal sagebrush and chaparral and during the dry summer can appear quite brown and desolate. Trail heading down toward another scenic overlook. Looking south over a sculpted sandstone canyon. Another fantastic view. Many beautifully eroded sandstone canyons run through the State Reserve. You’ll see more in upcoming blog posts. A glance back toward the ocean and a lone walker. We’ve nearly come full circle. 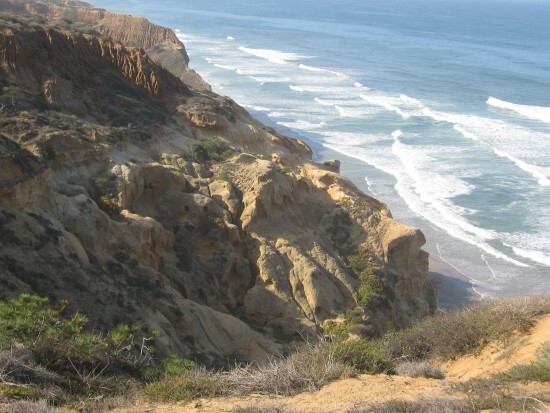 The sunshine and warm ocean breeze, the views, majestic Torrey pines, cacti and flowers…you really need to walk the Guy Fleming Trail to fully experience its magnificence! 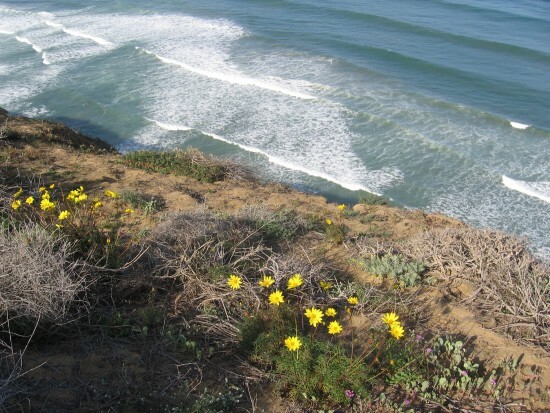 Posted on April 24, 2014 June 6, 2015 Tags amazing, beautiful, flowers, nature, pacific ocean, state parks, torrey pines, tourism, travel, walking5 Comments on Torrey Pines State Reserve’s Guy Fleming Trail. 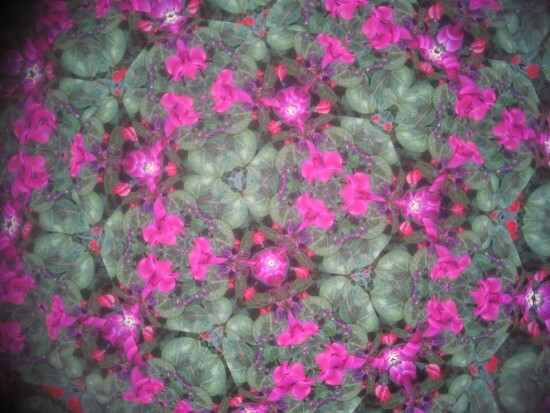 Kaleidoscope and a revolving bowl of flowers. Interesting contraption in a nook at artsy Spanish Village. 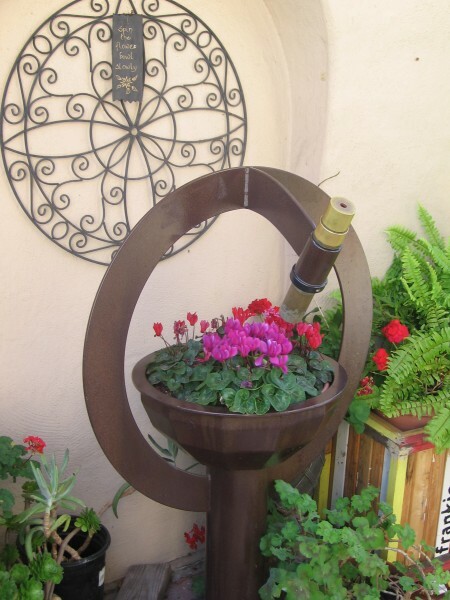 In a nook of Balboa Park’s Spanish Village, right next to the San Diego Mineral and Gem Society building, you’ll find this interesting contraption. Is it an antique device once used to navigate a ship? Is it a microscope? What is it? 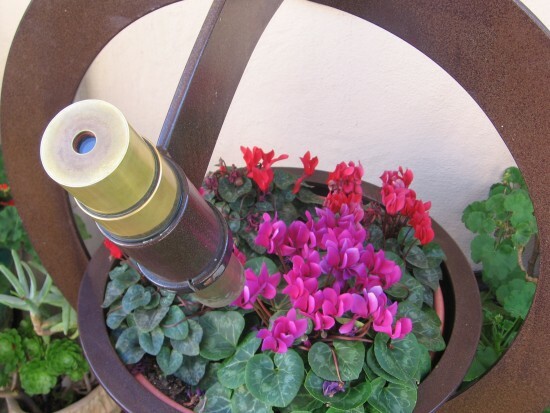 It’s a kaleidoscope mounted above a revolving bowl of flowers! Instead of turning the kaleidoscope tube, you whirl the bowl of blooms and watch different colorful patterns form through the lens. Several mirrors in the tube create the complex symmetry. Once I figured out what the contraption was, I tried putting my camera right up to the eyepiece. I got a bunch of interesting photos! 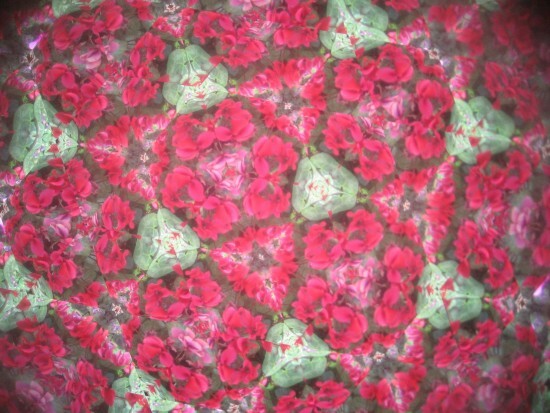 A kaleidoscope aimed at turning bowl of flowers. 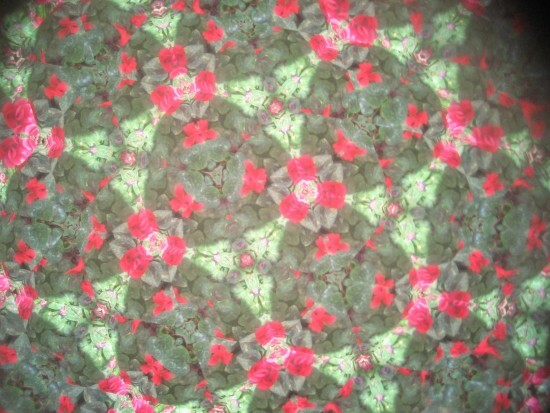 Mirrors of kaleidoscope turn flower blooms into art. Revolving the bowl turns flowers and leaves into amazing patterns. Infinite beauty created via the reflection of light. 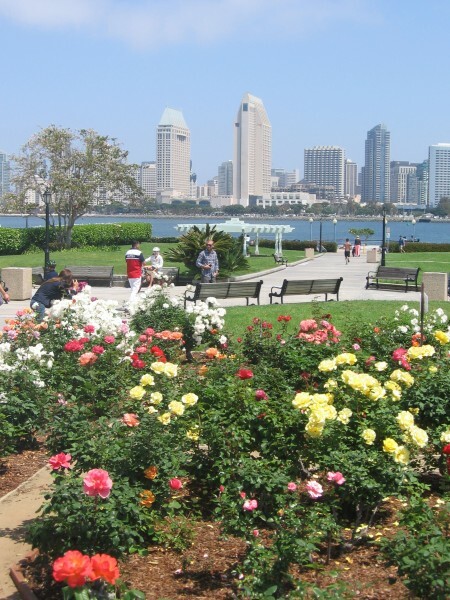 Posted on April 22, 2014 June 6, 2015 Tags amazing, balboa park, beauty, color, creativity, flowers, kaleidoscopes, photography, san diego, spanish village5 Comments on Kaleidoscope and a revolving bowl of flowers.